The T57 started life in the early 1950s. 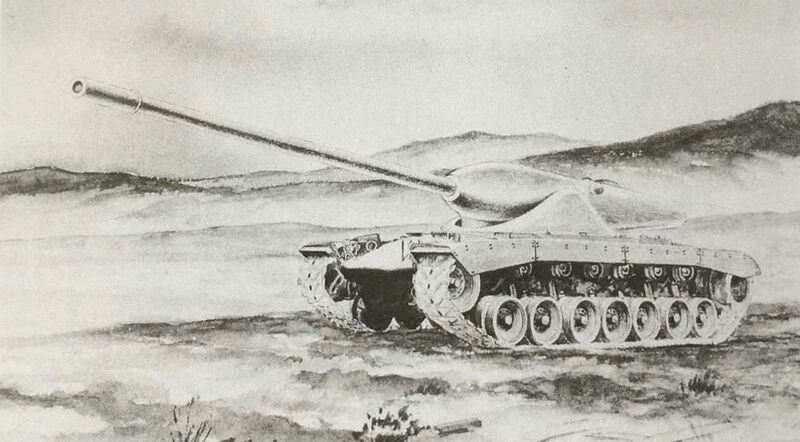 At this time, the 120mm Gun Tank T43 (which would become the M103) was well on its way to becoming America’s next heavy tank, but even before it had entered serialization, ideas began to circulate about future upgrades. One such idea was the possibility of mounting an auto-loading device in the tank’s turret, and further study into this idea proved that such a device would be ill-suited to the T43’s turret. As such, concentration turned to a new turret design, which would be mounted on pivoting trunnions. In other words, designers began to consider the addition of a new technology at the time, an Oscillating Turret. Testing at the Aberdeen Proving Grounds (APG) had already proved that smaller caliber guns worked in such turrets. There was no reason that a larger caliber gun, such as the powerful 120mm, wouldn’t work in such a turret. A development program was initiated on October 12th, 1951, with the project receiving the designation of 120mm Gun Tank T57. 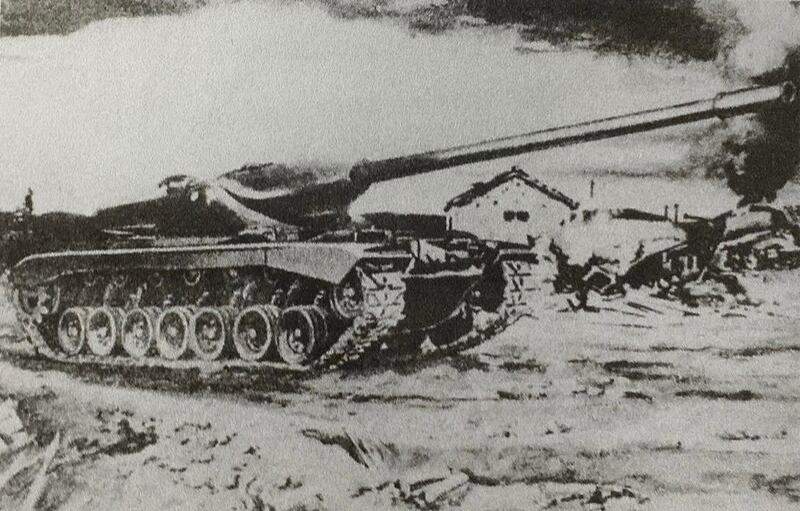 On 12th October 1951, a development program began to design a 120mm armed heavy tank with an Oscillating turret and automatic loader. Two pilot models were authorized, and the tank was designated as the 120mm Gun Tank T57. The turrets, each with 2.1 meter (85 inch) rings, were to be tested on the hull of the T43. Two hulls of which were earmarked for this purpose. The initial design for the autoloader was for a cylindrical type mounted directly behind the breach of the gun in the turret bustle. However, it was predicted that the measurements of such a device would take up a space of 76 cm – 1 meter (30 – 42 inches) but this depended on whether the cylinder would hold 11, 9 or 6 rounds. Army Field Forces (AFF) rejected this design, stating that such equipment would end up with the turret bustle being overly large in overall dimensions, as well as in the overhang of the bustle. To overcome this possible design flaw, a contract was drawn up with the Rheem Manufacturing Company to design and construct the two authorized pilot vehicles. The Oscillating type of turret consists of two actuating parts, these were a collar that is attached to the turret ring, allowing horizontal traverse, and a pivoting upper part that holds the gun, loading mechanism, and crew. Both halves of the T57’s turret were cast in construction, utilizing cast homogeneous armor. Armor around the face was 127mm (5-inches) thick, angled at 60 degrees. The armor on the sides of the turret was slightly thicker at 137mm (5.3 inches) but was only 51 mm (2 inches) on the bustle. The sides of the collar were bulbous to protect the trunnions that the upper half pivoted on, with the other half consisted of a long cylindrical ‘nose’ and a low profile flat bustle. The turret was mounted on the unmodified 2.1 meter (85 inch) turret ring of the T43 hull. Though it looks as though there were two, there were actually three hatches in the roof of the T57. There was a small hatch on the left for the loader, and atop the commander’s cupola which featured five periscopes and a mount for a .50 Caliber (12.7mm) machine gun. These hatches were placed on top of the third hatch, which was a large square that took up most of the middle of the roof. This large hatch was powered and granted a larger escape route for the crew but also allowed internal turret equipment to be removed easily. In front of the loader’s hatch was a periscope, and there was another above the gunner’s position. Behind the large hatch was the ejection port for spent cartridges. To the right of this was the armored housing for the ventilator housing. On each side of the turret were ‘frogs eyes’, the armored covers for the stereoscopic rangefinder used to aim the main gun. The initial Rheem concept had the gun rigidly mounted without a recoil system in a cast, low silhouette Oscillating turret, with the gun protruding from a long, narrow nose. The gun featured a quick change barrel, which was which was similar to the 120mm Gun T123E1, the gun being trialed on the T43. However, for the T57, it was modified to accept single piece ammunition, unlike the T43 which used separately loading ammo. This new gun was attached to the turret via a conical and tubular adapter that surrounded the breech end of the gun. One end screwed directly into the breach, while the front half extended through the ‘nose’ and was secured in place by a large nut. The force created by the firing of the gun and the projectile traveling down the rifled barrel was resisted by rooting the adapter both the breech block and turret ring. As there was no inertia from recoil to automatically open the horizontally sliding breech block, a hydraulic cylinder triggered by an electric switch was introduced which would be engaged upon the firing of the gun. In the oscillating turret, the gun could elevate to a maximum of 15 degrees, and depress 8 degrees. Projected rate of fire was 30 rounds per minute. The main gun had a limited ammunition supply due to the large size of the 1-piece rounds. The T43 hull had to be modified to allow storage, but even then, only 18 rounds could be carried. It was proposed that two .30 Caliber (7.62mm) machine guns would be mounted coaxially. This was later reduced to a single machine gun placed on the right side of the gun. The automatic loader used on the T57 consisted of a large 8-round cylinder located below the gun, and a ramming arm that actuated between positions relative to the breech and magazine. The loader was designed for 1-piece ammunition but an alternate design was prepared for use with 2-piece ammunition. Operation: 1) The hydraulically operated ramming arm withdrew a round and aligned it with the breach. 2) The rammer then pushed the round into the breach, triggering it to close. 3) Gun is fired. 4) Effect of gun firing trips the electric switch that opens the breech. 5) Rammer picks up a fresh round, at the same time ejecting the spent cartridge through a trap door in the roof of the turret bustle. Ammunition types such as High-Explosive (HE), High-Explosive Anti-Tank (HEAT), Armor Piercing (AP), or Armor-Piercing Ballistic-Capped (APBC) could be selected via a control panel by either the Gunner or the Tank Commander (TC). The HEAT round could punch through a maximum of 330mm (13 inches) of Homogeneous Steel Armor. The hull that was used for the project was the same as the 120mm Gun Tank T43, which would later be serialized as the M103, the US’ last heavy tank. Armor on the hull was unchanged. The cast “beak” was 100 to 130 mm (3.9-5.1 in) at the thickest. An 810hp Continental AV1790 12-cylinder air-cooled gasoline engine propelled this chassis to a speed of around 21 mph (34 km/h). The tank’s weight was supported on seven road wheels attached to the torsion bar suspension. The drive sprocket was at the rear while the idler wheel was at the front. The idler wheel was of the compensating type, meaning it was attached to the closest roadwheel by an actuating arm. When the roadwheel reacts to terrain the idler is pushed out or pulled in, keeping constant track tension. The return of the track was supported by six rollers. The T57 had a crew of four men. The Driver’s position was standard for T43/M103 hulls. He was located centrally in the bow at the front of the hull. Arrangements inside the turret were standard for American tanks. The Loader was positioned at the left of the gun. The Gunner was on the right with the Commander behind him. The T57 project eventually ground to a halt. Progress became slow due to delays in procuring some equipment from the US Government. This problem was due, in no small part, to changing opinions in tank design. Designers were moving towards lighter vehicles that retained powerful guns, instead of heavy (as in weight and class) tanks. One of the two pilot turrets constructed by Rheem was trial fitted to a T43 hull. Work on the project, however, stopped before tests of the systems could take place. The United States Ordinance Committee officially canceled the project on January 17th, 1957. Both turrets were subsequently scrapped, and the T43 hulls were returned to a supply depot for future use. The T57 did, however, live on in another tank project, but this time in the shape of a medium tank. This project was designated the 120mm Gun Tank T77. It was a project to mount the T57’s turret on the hull of the 90mm Gun Tank T48, the prototype of the M48 Patton III. Just one photo, a model, and blueprints exist. The Rheem Company would also continue to design tank components for the United States Military. Other projects they worked on included the 90mm Gun Tank T69, and 105mm Gun Tank T54E1 projects. Both of which featured similar turrets and loading systems. In late-2017, a scale model of the T57 produced by Rheem appeared on the internet auction sight, eBay. This model had appeared a number of times on the website without being purchased. The model was made for Fort Benning Armored Force Command. It is made from solid aluminum and weighs nearly 22 pounds (10 kg), it is also 2 feet (70 cm) long. 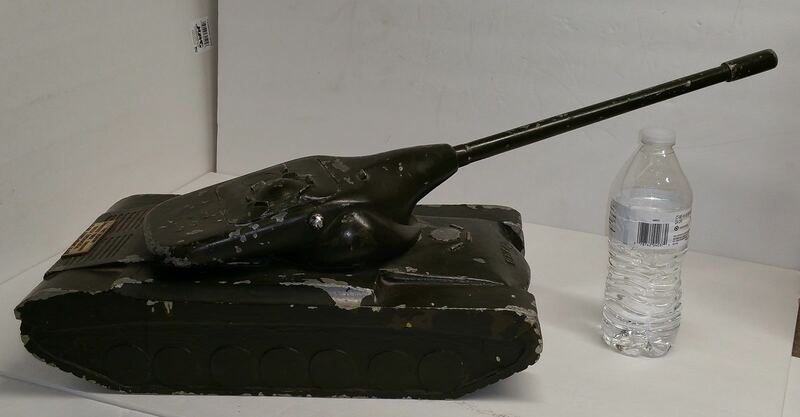 The scale model of the T57 from when the item was put up for auction on eBay. 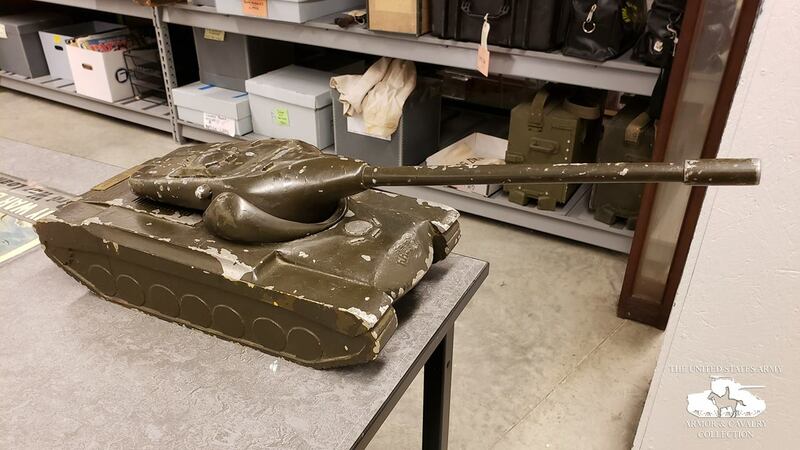 Rather than let the model fall into the hands of a private collector, and be hidden from view, the Tank Encyclopedia team decided to step in a secure its fate in partnership with the U.S. Army Armor & Cavalry Collection, Georgia, USA. A fundraiser was organized and launched by Andrew Hills of FWD Publishing – and one of our writers – on the website ‘GoFundMe’ in November 2018. The thinking behind this was that he (all of us) wanted to see the model get to its rightful home – a national collection where it could be enjoyed by future generations and help foster a greater understanding of the evolution of American armour. By the end of 2018, we had raised the necessary $700 to purchase the model. Just as planned, it was sent to the Museum. It is now safe and sound, reserved for future generations to see. Rendition of the T57 heavy tank in a fictional livery based on common styles from the era. Illustration by Alexe Pavel, based on an illustration by David Bocquelet. What is the differance between the 120mm T77 and this 120mm T57? Shouldn’t one make the other redundant? The T77 used a lighter version of the T57’s turret, mounted on the hull of the T48 (M48). On he T57, the turret was mounted on the T43 (M103) hull. The T57 was designed to be a heavy tank, while the T77 was an aimed at putting a larger gun on a medium tank. Ah. I see, thank you for clarifying that for me.